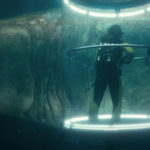 Having survived an attack by a prehistoric giant shark, Jonas Taylor returns to save the crew of a sunken submersible. This time he has to face the giant monster as it escaped it’s confined waters and threatens to kill anyone in it’s path. Jonas Taylor is a professional diver with a mission to rescue the crew of a wrecked submarine. During the operation he decides to leave some people behind as an unseen force hits and destroys the sub. Five years later at an underwater facility off the coast of China they perform experiments under a mysterious hydrogen layer. The submarine they use is hit by something large loosing contact with the facility while one of the crew is injured. The scientists decide to call Jonas to rescue them and while reluctant at first he decides to help them with the rescue. Suyin, one of the scientists, goes down to save the rest of the crew only to be captured by a giant squid which is killed by what attacked Jonas five years ago, a 75-foot long prehistoric shark called Megalodon. Jonas attracts it’s attention to save Suyin and saves the rest of the crew but Toshi sacrifices himself so the rest can escape but by doing so the shark escapes into open waters. After successfully tracking it they set a trap and finally manage to capture it and bring it on board. 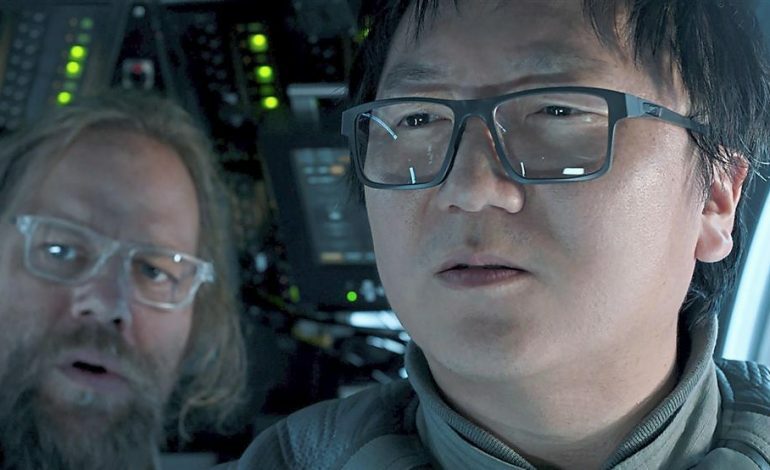 During celebration a bigger Megalodon destroys the boat, eats two of the crew but the rest manage to escape using motorboats while Dr Zhang dies from his wounds in the boat. Morris inform the rest of the crew that the underwater facility is closing and authorities have been notified of the threat while he goes out to deal with the problem on his own with some small military support. They set a trap but ultimately is being eaten by the shark. When the rest find out that the shark is heading to a populated area they decide to deal with it themselves. During an underwater confrontation Jonas manages to mortally wound the Megalodon making dozen other sharks to finish him off. With blockbuster film production costs climbing year after year we have reached a point where $200 million films is the normal for an event blockbuster film nowadays something that was inconceivable a few years ago. As such studios are turning to recognizable franchises in order to minimize the risk a film to fail to cover it’s expenses. Doing so has resulted in seeing movies that feel stagnant at offering something new or original. But once in a while we see films that come out of the blue with no previous record and not only manage to break even but also to raise a few eyebrows with what they offer. 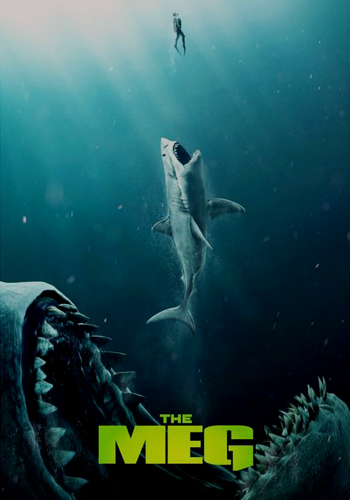 One such film is the new production from Warner called “The Meg” and while the story is not entirely new as it is an adaption of the novel “Meg: A Novel of Deep Terror” by Steve Alten it has been transferred into the big screen with great success bringing a fresh change to an otherwise uninteresting collection of films we saw lately. In all honesty before seeing the film we had little clue on what to expect and other than Jason Statham and a relatively uninteresting trailer we didn’t know how it would turn out. This in the end turned to be a good thing as the film surprised us pleasantly with what it offered and managed to leave a smile on our face when the credits started to roll. First of all when you start to watch a film that includes 75-foot long prehistoric sharks the size of a house it is advisable during viewing to switch off your brain and enjoy what you see just for the fun and enjoyment of it. If you try to watch such a movie with a different mindset and try to find some realism out of it then you will definitely not only hate it but also will regret every minute you spent watching it. Films like this are pure entertainment and have no connection to science or realism. The film may not offer anything extremely new as it follows known paths in the way it depicts action but it is so well made and everything works so good that the end result is more than satisfying. The story may be unbelievable and hovers at borderline stupid but what is more important is that it has very good flow and at no point did it feel boring and even when dialogue was dominant in scenes it keeps your interest until the next action scene. It’s a film that never tried to take itself too serious and that’s why it works so well in so many ways. The casting was adequate with Jason Statham giving his characteristic performance and although he may not earn any academy awards, for such a film his acting style fits very well. Li Bingbing is coo-staring as the female scientist that supports Statham in his mission and the two of them have very good chemistry that is becoming very obvious when both of them are in the frame. The rest of the cast is adequate but also forgettable and they are there just to support the two main actors. What we really loved about the film was the exceptional photography. The underwater scenes were masterfully created giving you a real sense of the depth while above the water we get some amazing landscape shots like in the final act during the Sanya Bay sequence. Effects are also very well made and although the sharks would reveal their CGI nature they were very well made so it didn’t bother us at any point. 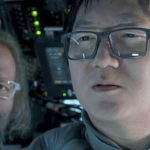 Of course with so many CGI shots it was natural for a few scenes here and there to have less than stellar computer effects but in total the effort was very good creating some amazing monsters while the depth scenes looked amazing. The music was composed by Harry Gregson-Williams and being a composer that is used to create music for blockbuster, visual effects driven films his composition really fits the light mood the film-makers tried to give to the movie. 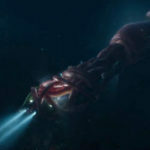 The Meg obviously got some influence from the Jaws and Harry Gregson-Williams made sure to pay homage to this classic film by adding a few familiar rhythms to the mix. Closing we just have to say that the film worked very well in so many ways. Not taking itself seriously in combination with the light mood it emits through it’s running time makes the actual content not only watchable but also enjoyable. The story although completely unreal flows very well without any major slowdowns and when the action kicks in it keeps you on the edge of your seat until the end. Having such a success almost surely guarantees a sequel and we are very curious to see if they will manage to repeat the success they managed to achieve with this one. If you look to spend two hours of pure entertainment then The Meg is a movie that we definitely recommend. 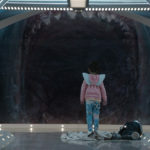 The Meg bites into home media with a 2160p, HEVC/H.265-encoded UHD from Warner using a 2.39:1 ratio and in all honesty this is one of these encodes that truly show the capabilities of the new format. Although the film was shot digitally with Arri cameras in 2.8K resolution thus making this release a 4K upscale from its Digital Intermediate the amount of clarity and sharpness is through the roof. We don’t know if this was intentional by the filmmakers but the picture is free of any noise or grain making the image have an almost sterilized look and clean texture. This matches very well the photography of the film and fits the setting especially during the underwater lab sequences where the environments have a clean and sterilized look. It almost reminded us of Oblivion, which also had a similar look to a lot of it’s scenes. The 4K UHD release comes with Dolby Vision and HDR is really breathtaking. Colors really pop out and especially during the last act in the China’s Sanya Bay where the crowd is in vivid colors swim gear the result is a celebration of colors and textures. But also during the underwater scenes with different shades of blue and grey colors the lights of the submersibles are cutting through the darkness and reveal a wide range of details. The UHD disc comes with a Dolby Atmos audio track that is just as good as the image quality we analyzed just now. Since the film takes place mostly underwater the bass is very dominant in these scenes without overwhelming the rest of the effects. With the addition of the height speakers there are moments where you will definitely feel like being in the bottom of the ocean. During the last act with the underwater chase the surround speakers became more active expanding the sound-stage behind us and revealing more action in the back giving us a very good sense of what was going on. We could not be more than happy with this release. The 4K disc provide excellent sharpness and a huge amount of details while HDR provide dazzling brightness and colors that really pop out of the screen. On the other hand the Dolby Atmos track may not be the most bombastic one you have ever heard but it provides enough sound effects and immersion that fits the film amazingly making this UHD the best release of the film and one that you can definitely use to show the quality of your TV as well as your home theater. The movie was great and thankfully this encode follows suit. I have not seen this film yet, but being a fan of thrillers/horror movies, and from your description of the movie, I will definitely check this one out. I am in the process of buying a 4K TV (just waiting for the black Friday special to come one in my hometown), so a 4K digital disk will be a nice addition to my purchase to check out its capabilities. Thanks for this thorough review, it has made my decision a lot easier. If you like this style of films then you will definitely enjoy it Denis. And the 4K UHD disc is a must if you want to test out a 4K TV so it’s a good opportunity to look at it. I just watched The Meg about a week ago and I think it’s a great film to enjoy with your family. It has a lot of humor and I really enjoyed the action-packed scenes. What I also liked is the fact that this Megalodon shark could actually exist somewhere because I’ve heard that the ocean is 95% unexplored. You mentioned this movie may be unbelievable and borderlines stupid, but why is this? Do you think the idea that an undiscovered giant prehistoric shark existing somewhere in the deep oceans is near impossible? No I said that because there are some scenes that are completely unbelievable. I know that Hollywood like to stretch reality and science to the limits but some moments go beyond even that. I cannot say anything more without giving away spoilers but if you have watched the movie the you know how it ends. I will leave there. But the film was bold, funny and offered something different. I definitely liked it even with it’s unbelievable moments. I must say that I enjoyed while reading this awesome article. I am a big fan of horror movies and movies with sea creatures. I found that price of the movie is not expensive at all and I will definitely buy the movie until New Year. Thanks for such in depth review, it is epic. I am glad you liked our review Daniel. Only I should mention that the film is not horror. I would categorize it as an action film with comedy elements. But if you like sea creatures you will love this for sure. I saw the trailer for this and my first thought was, “How the heck did Jason Statham get Rosie Huntington-Whiteley.” I just will never get it. But I always think that! He is a good actor for action films, I liked The Expendables. And he was funny in Spy. I do think The Meg does look like a fun movie to watch though. I like things that are outside of reality. I had the same question as you James but it seems some things will always remain unexplained. Good film though and Statham is like at home in films of this style. Wow, What a useful review! I really enjoyed the review!! The whole family has watched this movie in a movies house, and it was absolutely fantastic! I would highly recommend this movie to anyone who is looking for an exciting and funny film. I’ll check this further on Amazon. Just a question, please. Is it possible to sell the movie once we finished watching it? I am glad to hear that you enjoyed it. As for your question there are many second hand stores that buy used film discs but I cannot help you with this. I suppose a search on the internet will solve all your questions. I saw this movie, I liked it so much! I wouldn’t say it is like Jaws, because Jaws was really epic. But if you compare it, it is the mama of Jaws. I love the suspense in it, the only ‘bad’ thing is that there werent too many massacres as there were in Jaws. Anyway, great post and thanks for sharing! The film was obviously not meant to be a horror film, it’s an action movie but with a very light tone which was obviously done to attract more people.